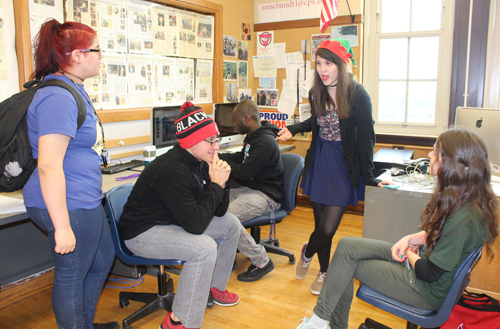 Steinmetz Star reporter McKenzie Lacefield talks to Star co-editors in chief Alejandro Hernandez (in hat) and Zaneta Marcinik (right) and reporters Daria Velezquez (left) and Brian Geans (middle) on Dec. 16, 2015, about what Principal Stephen Ngo told her and her journalism classmates about the censorship of her article. Because she was blocked from publishing the news story in the Nov.-Dec. 2015 Steinmetz Star, Lacefield published the story on her own website: childoffire.wordpress.com. Substance photo by Sharon Schmidt.Lacefield's story, a comprehensive look at the change to Steinmetz' bell schedule made by CPS for the 2015-16 school year, answers questions of why the change happened and how people at the school feel and are affected by the change. CPS moved Steinmetz' schedule one hour later than last year to 9 a.m. to 4:11 p.m.
Steinmetz students in Lacefield's journalism class tabulated more than 1,400 surveys of school staff, parents and students and transcribed dozens of the comments people wrote. They analyzed the schedules of other schools in CPS, interviewed the principal and LSC president, and researched CPS officials' statements. Their inquiries to the CPS Office of Communication and to the Network 3 Chief, however, went unanswered. See a Dec. 26, 2015, Substance article "Chicago principal censors the Steinmetz Star, one of Chicago's most highly praised school newspapers" for more information.